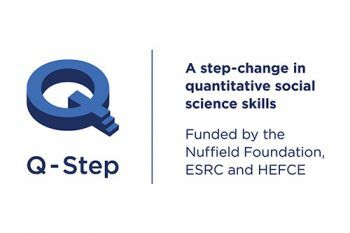 The Q-Step Centre at City University London, funded by the Nuffield Foundation, the Economic and Social Research Council (ESRC) and the Higher Education Funding Council in England (HEFCE), will promote education in quantitative social science. City University London is one of 15 UK universities to receive a share of £19.5 million as part of an ambitious intervention to address a critical shortage of social scientists with the high-level quantitative skills needed for the analysis of complex data. City's Q-Step Centre will give social science undergraduates the opportunity to develop quantitative skills in workplaces and provide the unique opportunity of working with different types of data from many countries. Following an open competition, 15 universities, selected from the total of 48 who applied, have been chosen to form a network of 'Q-Step' Centres. The Q-Step Centre at City will build data literacy in seven social sciences undergraduate programmes and introduce specialist pathways for students on four degree programmes, including Criminology and Sociology. The City Q-Step will build on the University's long-standing expertise in quantitative methods. The Centre for Comparative Social Surveys (CCSS) at City, founded by the late Professor Sir Roger Jowell, houses the award-winning European Social Survey (ESS), a 36 country pan-European survey of attitudes and values. Students will work with experts from the CCSS in questionnaire design, adaptation and implementation across Europe. Final year students will be able to apply for international placements at institutions with specialist survey expertise. City will also be working with several partner organisations, including NatCen Social Research, the UK's leading independent social research agency, to host student placements. NatCen's research staff will share with students through workshops, career advice sessions and lectures their experiences of some of the UK's most challenging research studies. Universities and Science Minister David Willetts, said: "Evaluating and analysing data is an essential part of science education and we need more people with these important skills. Q-Step will deliver an exciting programme, increasing the number of skilled graduates in quantitative social science. By sharing expertise and resources across the education sector, this programme is a step in the right direction to give students the skills they need and help employers build long lasting relationships with universities." Professor Paul Curran, Vice-Chancellor of City University London said: "We are proud of our education and research in the quantitative social sciences and are pleased that the three funding bodies have recognised the contribution we can make to the education of the next generation of social scientists". Dean of the School of Arts & Social Sciences, Professor Andrew Jones, said: "In a world where quantitative information is filtered and presented in a variety of numerical and graphical formats, it is ever more necessary for graduates to be able to make sense of these data. City Q-Step will equip social science students for the labour market and for informed citizenship. "City is home to several initiatives, such the European Social Survey, for which quantitative methods are key. The investment in a Q-Step Centre will enable us to enhance our reputation and ensure that our graduates have a chance to develop their knowledge in quantitative methods." Kandy Woodfield, NatCen Director of Learning said: "NatCen is committed to building capability and capacity in the social research sector. We are delighted to be working alongside City University London in this important initiative which is building a strong future for quantitative social science in the UK. Our geographical proximity and track record of collaborating with City University London on a range of social science research provide us with a firm foundation for this exciting new partnership."